Ergot alkaloids are derived from tryptophan, mevalonic acid, and methionine (Birch et al. 1960; Groger et al. 1960; Taylor and Ramsted 1960). The origin of the ergoline part from tryptophan and dimethylallylpyrophosphate was established at an enzymic level. The cell free biosynthesis of chanoclavines-I and II, agroclavine, and elymoclavine from precursors has been reported by Sajdl and Rehacek (1975) and Cavender and Anderson (1970). Tryptophan has also been found to be a factor in the induction and depression of enzymes catalyzing alkaloid formation (Krupinski et al. 1976). The first enzyme of alkaloid biosynthesis is dimethylallyltryptophan synthase (DMATS) (Heinstein et al. 1971) and the encoding gene was cloned from C. fusiformis and C. purpurea (Tsai et al. 1995; Tudzynski et al. 1999). Recent data of Tudzynski et al. (2001) show that in C. purpurea, all genes involved in alkaloid biosynthesis are organized in a cluster and are regulated by phosphate and pH level. This finding verified the previously published data on the negative role of phosphate in the induction of enzymes catalyzing the alkaloid synthesis (Krupinski et al. 1976) and on inhibition of alkaloid synthesis by high concentration of phosphate in the culture medium (Mehta 1984; Pazoutova et al. 1983). Gene for peptide synthetase homologous to that of C. purpurea was also detected in Epichloe and Neotyphodium species (Annis and Panaccione 1998; Panaccione et al. 2001). Figure 2 General structure of secoergolenes (1), A8'9-ergolenes (2), and A9'10-ergolenes (3). Figure 3 General structure of lysergic (1) and paspalic (2) acid derivatives. sclerotial phase or both (Mehta 1984). In strains with not clearly separated conidial phase, vegetative growth, and the alkaloid phase, the conidia formation occurs simultaneously with alkaloid synthesis. The morphological development of the mycelium in submerged Claviceps cultures shows significant differences between high-yielding and degenerated cultures (Flieger et al. 1982). 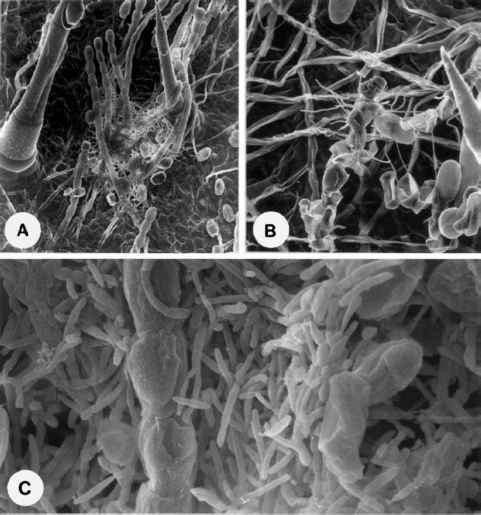 The character of fat hyphae and sclerotia-like cells of submerged mycelium is reminiscent of the plectenchymatic structure of parasitic cultures and have been found to influence the alkaloid production in C. fusiformis (Dickerson et al. 1970). Cultivation conditions convenient for primary metabolism are not suitable for high alkaloid production (Taber and Vining 1963). To obtain overproduction of alkaloids, high citrate or Krebs cycle intermediate level in the medium is required (Pazoutova et al. 1981). The inability of submerged Claviceps cultures to grow on hexoses in absence of Krebs cycle intermediates comes from the parasitic way of life where the level of citrate and malate in the host plant phloem sap is high. The rate of oxidative metabolism of saccharides and the activity of alkaloid synthesis were proved to be proportional (Pazoutova et al. 1981). Another important fact is that clavine alkaloids are extracellular products with high solubility in the culture medium and feedbacks regulate their own biosynthesis (Flieger et al. 1988). Ergopeptines are mostly intracellular and are accumulated in lipid droplets (oleosomes) with no influence on the metabolism (Neumann et al. 1979).